Susan Hockfield (born March 24, 1951) is an American neuroscientist who from December 2004 through June 2012 served as the sixteenth president of the Massachusetts Institute of Technology. Hockfield succeeded Charles M. Vest and was succeeded by L. Rafael Reif, who had served in her administration as Provost. Hockfield was the first biologist and the first woman to serve as the Institute's president. Hockfield, Professor of Neuroscience in MIT's Department of Brain and Cognitive Sciences and a member of the Koch Institute for Integrative Cancer Research, is a director of General Electric and of Qualcomm. She is an overseer of the Boston Symphony Orchestra, a trustee of the Carnegie Corporation of New York, and a member of the MIT Corporation. Before returning to MIT following her presidency, Hockfield held the Marie Curie Visiting Professorship at Harvard University's John F. Kennedy School of Government. She attended Horace Greeley High School in Chappaqua, New York and graduated in 1969. She received her bachelor's degree in biology from the University of Rochester in 1973 and her Ph.D in Anatomy and Neuroscience from the Georgetown University School of Medicine in 1979. Her doctoral dissertation centered on the subject of pathways in the nervous system through which pain is perceived and processed. Her advisor during her doctoral work was Stephen Gobel. Following a postdoctoral fellowship at the University of California, San Francisco, Hockfield joined the staff of the Cold Spring Harbor Laboratory in 1980: she was hired by James Watson, who, with Francis Crick had discovered the structure of DNA. In 1985, Hockfield joined the faculty of Yale University. She received tenure in 1991 and became a full professor of neurobiology in 1994; soon thereafter she began to take on positions of administrative leadership. From 1998 to 2002, she served as Dean of the Graduate School of Arts and Sciences, with oversight of 70 graduate programs. Over the course of her deanship, the number of applicants to the graduate school doubled while graduate student support expanded in many dimensions, including healthcare, career counseling, fellowships, and opportunities to interact with faculty. In December 2002, she was named Yale's Provost, the university's second-highest officer, with oversight of the university's 12 schools. As Provost, she led major initiatives in science, medicine, and engineering, including a $500 million investment in scientific facilities. During her time as dean and provost, Hockfield was at the center of the imbroglio surrounding the Graduate Employees and Students Organization and its unionization efforts. While Yale opposed the student union, Hockfield made healthcare for PhD students free and increased stipends for graduate students. In August 2004, the Massachusetts Institute of Technology named Hockfield its next president. Hockfield pioneered the use of monoclonal antibody technology in brain research and discovered a gene that plays a critical role in the spread of cancer in the brain. Hockfield's early work involved the application of monoclonal antibody technology to questions within neurobiology. She and her colleagues identified a family of cell surface proteins whose expression is regulated by neuronal activity early in an animal's life and reflect the effect of early experience on brain structure and function. A link between her research and human health was made when it was suggested that one of these proteins played a role in the progression of brain tumors. Hockfield's work on one type of brain tumor called glioma identified molecules that allow glioma cells to move through normal brain tissue, the feature that makes glioma particularly deadly. Hockfield's presidency saw the most successful period of fundraising in MIT history, during which MIT raised nearly $3 billion. However, the global financial crisis put great pressure on the Institute's endowment, which was valued at $5.9 billion upon Hockfield's arrival. It peaked at $9.9 billion in June 2008, then fell to $7.9 billion. By June 2011, it was valued at $9.7 billion. Through the financial ups and downs, Hockfield made affordability a priority: annual undergraduate financial aid increased by about 75 percent during her presidency. In her inaugural address, Hockfield called for MIT to cultivate the convergence of engineering and the life sciences to develop new approaches to address global challenges. Toward that end, she led, among other efforts, the establishment of the David H. Koch Institute for Integrative Cancer Research and the Ragon Institute of Massachusetts General Hospital, MIT, and Harvard University. She encouraged work that crossed disciplines, departments, and schools within MIT and that fostered collaborations among the Boston region's academic medical centers and educational institutions. She catalyzed the development of the Massachusetts Green High Performance Computing Center in Holyoke, Massachusetts, an unprecedented collaboration of 5 universities, 2 private companies, and the Commonwealth of Massachusetts to provide state-of-the art computation tools for research advances. Hockfield also announced her intention to develop a multidisciplinary, Institute-wide center around energy. That effort spawned the MIT Energy Initiative, which raised more than $350 million during Hockfield's tenure and accelerated research on technologies and policies for a sustainable energy future. In 2009, U.S. President Barack Obama give a major address on U.S. energy policy at MIT, where Hockfield gave him the first tour of an MIT laboratory by a sitting U.S. president. During Hockfield's presidency, the numbers of underrepresented minorities and women increased in the undergraduate, graduate, and faculty populations. The graduating Class of 2015 will be composed of 45 percent women and 24 percent underrepresented minorities. To address the growing interest in attending MIT (applications more than doubled during her tenure), Hockfield initiated an expansion of the undergraduate population. She also guided enhancements to student life and learning, including the construction of a new residence for graduate students and a restoration of MIT's oldest building into an undergraduate residence with expanded space and amenities to foster student collaboration. During Hockfield's presidency, the east side of MIT's campus was enhanced by an extension to the Media Lab complex and a new building for the MIT Sloan School of Management. Hockfield led a comprehensive strategic planning process for campus development and also worked to foster the innovation cluster around Kendall Square, which at the end of her presidency was home to more biotech and life sciences companies per square mile than anywhere in the world. Hockfield is married to Thomas N. Byrne, M.D (Clinical Professor of Neurology at the Harvard–MIT Division of Health Sciences and Technology). They were married on March 2, 1991 at Yale's Battell Chapel. They have a daughter, Elizabeth. Honorary degrees from Brown University, Icahn School of Medicine at Mount Sinai, Tsinghua University, University of Edinburgh, Pierre-and-Marie-Curie University (University of Paris 6), University of Massachusetts Medical School, University of Rochester, the Watson School of Biological Sciences at the Cold Spring Harbor Laboratory, and a jointly awarded honorary degree from the Universidade Nova de Lisboa, the Technical University of Lisbon, and the University of Porto. Amelia Earhart Award, which is given by the Women's Union to honor women who have significantly contributed to the expansion of opportunities for women. Pinnacle Award for Lifetime Achievement from the Greater Boston Chamber of Commerce. The Age of Living Machines: How Biology Will Build the Next Technology Revolution, W. W. Norton & Company, 2019. ISBN 978-0-393-63474-7. ^ Nickerson, Nate (2012). "Susan Hockfield to step down - MIT News Office". web.mit.edu. Retrieved 1 March 2012. ^ Hockfield, Susan Joan (1979). Afferent and efferent neuronal connections of the dorsal horn of the caudal medulla (trigeminal nucleus caudalis) demonstrated by retrograde labeling with horseradish peroxidase (Ph.D.). Georgetown University Medical Center. OCLC 122259522 – via ProQuest. (Subscription required (help)). ^ Bombardieri, Marcella (August 26, 2004). "MIT set to pick its first female president". The Boston Globe. ^ "Susan Hockfield and Thomas Byrne, Medical Professors at Yale, Are Wed". The New York Times. March 3, 1991. Retrieved 2007-01-07. 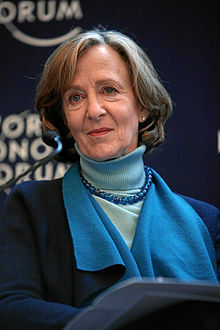 Wikimedia Commons has media related to Susan Hockfield. Interview on "Charlie Rose" February 2008. Promoting a Culture of Science in the United States Appearance on the Takeaway June 2012.